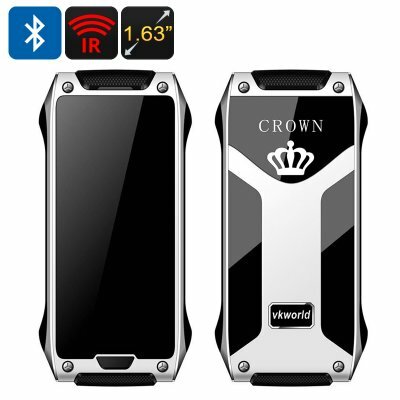 Successfully Added VKWorld CROWN V8 Cell Phone - Dual SIM, 1.63 Inch Gorilla Glass, IR, Bluetooth, Thermal Touch, Pedometer (White) to your Shopping Cart. The VkWorld CROWN V8 GSMphone makes a great secondary phone or even a primary one if you value simplicity, functionality and ease of use. The cell phone sports a thermal touchscreen, Bluetooth support, a built-in IR blaster, pedometer and more. The VkWorld CROWN V8 comes with a stunningly innovative design and promises to be one of the thinnest phones in the world. But don’t be fooled by the its fragile-looking frame — the cell phone comes with a strong build and its 1.63 inch OLED display is protected by Corning Gorilla Glass 4. The built-in IR blaster adds a whole other level of convenience. With it, you will be able to control your TV or aircon without roaming around for remotes. The phone also comes with a pedometer and you will be able to keep track of your fitness progress throughout the day. Bluetooth support is great, as it lets you use the VkWorld CROWN V8 as a secondary device, should you choose to do so. You can then connect it to your iPhone or Android device and sync contacts, messages, receive calls and more. With the SC6531D processor sporting a low power consumption chipset, the phone’s 780mAh battery lasts longer and lets you enjoy your feature-full device for more. Enjoy continuous usage time of up to 3 hours and 24 hours on standby.